Venerable Rulian addresses attendees at the baby blessing of the Cherry Blossom festival at Fo Guang Shan Buddhist Temple, Flat Bush. It was a celebration of art, creativity, culture and diversity. The incessant rain didn’t stop the opening of the Cherry Blossom Art Salon Festival held in conjunction with the two-day Cherry Blossom Festival at the Fo Guang Shan Buddhist Temple in Flat Bush at the weekend. An entertaining lion dance followed by the sheer beauty and virtuosity of technique by harp player Lana Solar set the mood for the opening of the art exhibition. The event was attended by special guests including Howick Local Board members Adele White and Peter Young, Counties Manukau East Police area commander Inspector Wendy Spiller, strategic advisor for Human Rights Commission Inspector Rakesh Naidu and Howick Ward Councillor Sharon Stewart. Being blessed by Venerable Abbess Manshin at the Cherry Blossom Festival. Times Photo Wayne Martin. The Cherry Blossom Art Festival, which runs until December 9, has works of more than 90 artists exhibited at the Fo Gaung Yuan Art Salon. 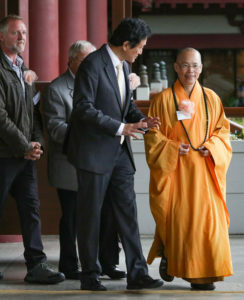 The downpour on the weekend didn’t stop dignitaries from attending the opening of the Cherry Blossom Art Salon at the Fo Gaung Shan Bhuddist Temple in Flat Bush. Times Photo Wayne Martin. 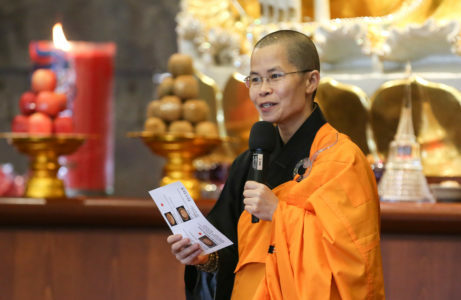 Curated by Venerable Abbess Manshin, there are more than 300 exquisite works of art that include wooden and copper sculptures, glass artworks, jewellery, ink paintings, oil paintings on canvas that each tell a story through different mediums. The idea behind the festival is to encourage people to share their learning through art, to connect and come together in harmony to create a better society. 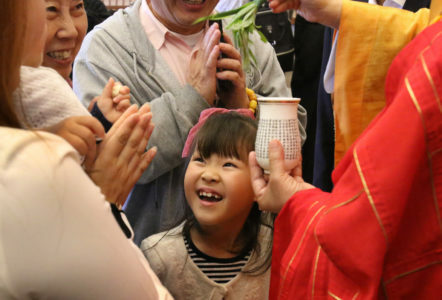 The popular tea meditation ceremony as well as the Blessing of the Baby ceremony had a lot of young families with their babies in tow waiting to be blessed by the Venerable Abbess.